With great joy we announce that His Holiness, Pope Francis, has appointed Most Reverend Bishop Gregory L. Parkes, Bishop of Pensacola-Tallahassee, Florida, as the fifth bishop of the Diocese of St. Petersburg, Florida! Bishop Parkes succeeds the retiring Bishop Robert N. Lynch, who has served as Bishop of St. Petersburg since his installation in 1996. “I am filled with joy that Pope Francis has appointed Bishop Parkes as the new Bishop of the Diocese of St. Petersburg. 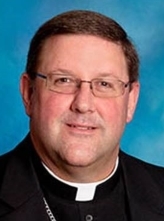 I invite the faithful of our diocese and of the Diocese of Pensacola-Tallahassee to join me in offering prayers of thanksgiving and to pray for Bishop Parkes as he transitions to shepherd the people of the Diocese of St. Petersburg,” Bishop Lynch said.